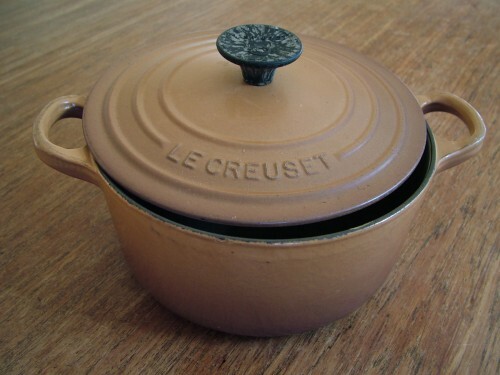 A cast iron casserole, a Le Creuset or Dutch Oven, as it is called in the States. First, having completed a wine-tasting session at Ballymaloe Cookery School, I sneaked into the back of a class on fermentation, given by Darina Allen and Emer FitzGerald. It was a fascinating talk, and I wish I hadn’t been obliged to race off back to Wicklow. For me the most interesting part was the sourdough bread, which did not require any kneading and was baked in a cast iron casserole preheated in a very hot oven. The idea came from Chad Robertson of Tartine in San Francisco. Three days later, watching Paul Hollywood on the Food Network channel, he introduced a New York baker who produced a fail-safe no-knead bread baked in the same vessel. See http://www.foodnetwork.co.uk/video/no-need-to-kneed-this-bread-dough.html for the same video. In both cases, you fold rather than knead the bread, and in both cases, you preheat the casserole, bake the bread for 20 minutes with the lid on, and then a further 15-25 minutes without the lid, allowing the crust to crisp up. I tried both out. I baked my sourdough at a very high temperature, which shattered my Le Creuset handle, and the loaf stuck a little to the bottom of the casserole. I now unscrew the handle and sprinkle a little wholemeal or rye flour on the casserole before adding the bread. It works a treat. I can now cook really good bread, both sourdough and standard, to a very high standard. 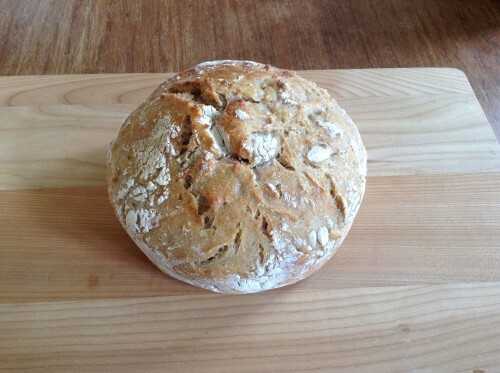 I usually mix strong white flour with a proportion of whole meal, rye or granary. It may not look quite as artisanal as real bakery bread, but the crumb and moisture is good, the crust nice and crunchy, and the flavour excellent. This is a recipe from Tomasina Miers in The Guardian (18th June, 2016). I changed it around a bit using a large piece of salmon, as I was unable to find sea trout. I hadn’t made a mayonnaise at home for years, largely because it tastes so good, I end up eating far, far too much. I also served it warm. The dish was great, really summery with masses of fresh vegetables and herbs. My one criticism is the asparagus turned an unappetising brown colour once I added the white wine. To drink, I opened up a bottle of Domaine Huet Vouvray Le Haut Lieu 1990; sadly it was oxidised. Instead we drank the delicious Dveri Pax Llovci Furmint (Sipon) – €22 from Wines on the Green, and a bottle of Carneros Pinot Noir from Stemmler, a present from my sister. Put all the ingredients for the fish apart from the water in a deep roasting tin that’s big enough to hold the trout flat (or use a fish kettle). Add cold water to cover, measuring the amount, then add a tablespoon of fine sea salt for every 1.3 litres of water. Bring to a boil, then cover tightly in foil and take off the heat. Leave the fish to sit in the water until it has cooled, then lift out on to kitchen paper to drain. Transfer to a serving platter, cover with clingfilm and refrigerate – you can make it to this stage up to a day ahead. Heat a deep sauté pan or casserole on a medium flame and add the oil and butter. Sweat the onions for five minutes, then add the garlic and cook for three to four minutes, until soft and translucent. Add the beans, asparagus and wine, leave to bubble for two minutes, season, then toss in the peas and mint. 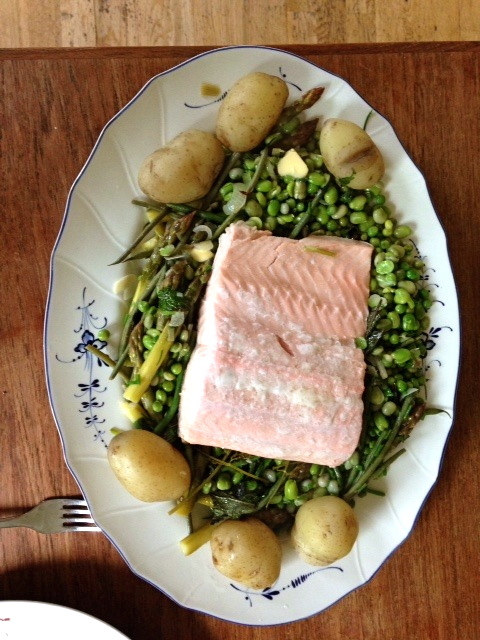 Cook for a few minutes, until the peas and beans are tender, season and spoon around the fish. Serve with the aïoli, and rye sourdough or steamed jersey royals. The search for a decent pork chop. For various reasons (including flavour), I only ever buy outdoor reared pork. For many years I was able to buy Marks & Spencer thick pork chops, at one stage even with a delicious kidney attached. These disappeared off the shelves recently, so I came up with a new idea – buy a loin roast and cut pork chops to your own specifications. I tried a shoulder roast, which was a bit tough, but the loin is very good. 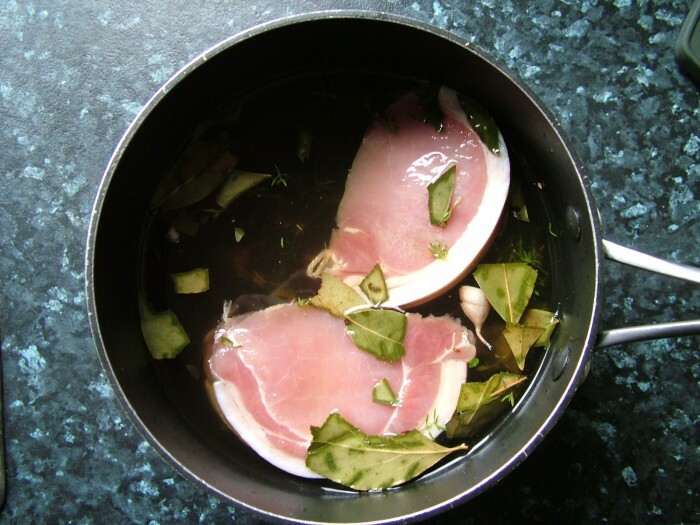 Better still, if you find pork chops tasteless, use a brine. I have been brining pork roasts and chops for a few years now; it is very easy and really makes the pork taste amazing. You just need to make a basic brine by dissolving salt and sugar in boiling water, add flavourings and leave for a couple of hours. I do it overnight for a full roast, although you don’t get good crackling this way. Dry off before grilling or roasting and enjoy a really juicy flavoursome pork chop. 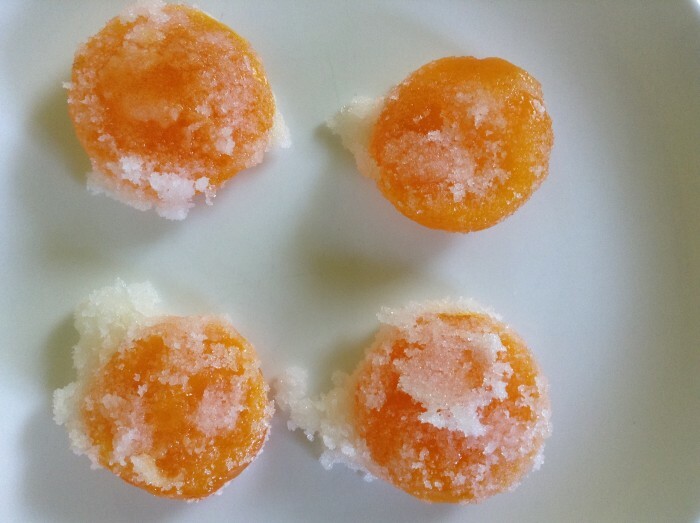 I enclose a brief recipe below, but I change the ingredients nearly every time. All or any for the following seasonings: garlic (smashed); chopped onions; ginger; toasted cumin and/or fennel seeds, toasted and smashed; juniper berries, bay leaves, sage leaves; thyme, chili flakes.